Starting Tuesday, April 23 – Thursday, April 25, field crews from Bryan’s Water Services Department will be performing smoke testing of the sanitary sewer lines to identify broken pipes and other defects. Starting at about 8 a.m., field crews will inject smoke into the sewer lines through manholes in order to perform this test. Testing could continue intermittently through the end of April. Field crews will enter properties to document defects. At no time will crews need to enter private residences. Citizens do not need to be home during the test. The smoke will exit from vent pipes on the roofs of houses and commercial businesses, from manholes, and ground where broken sewer pipes may exist. The smoke is non-toxic, leaves no residue and creates no fire hazard. The smoke will not enter a house unless there is defective plumbing present or the drain traps are dry. To help prevent smoke from entering a home or commercial business, please pour about 1 gallon of water into any seldom-used drain. 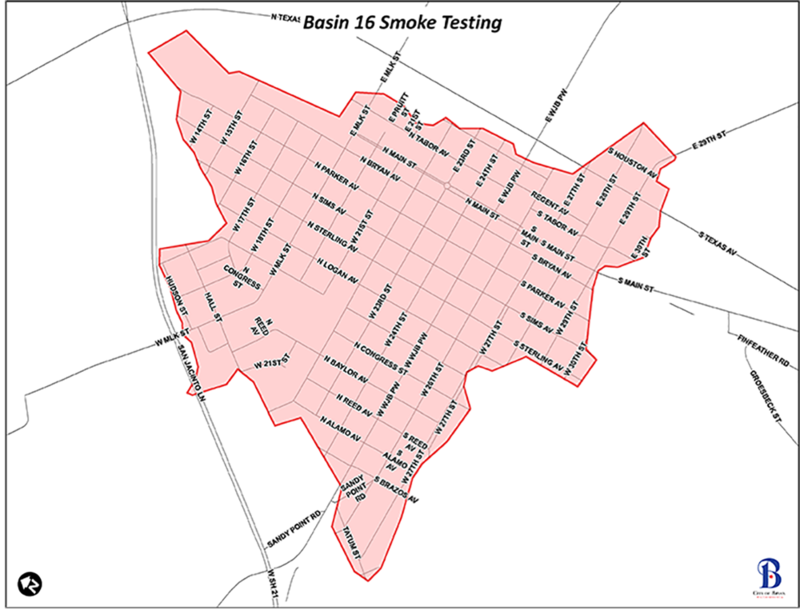 This map shows the areas of Bryan that will be tested. The target area consists of properties located within the boundaries of: Tatum St., Anderson St., Sandy Point Rd., W. 27th St., N. Brazos Ave., S. Alamo Ave., N. Alamo Ave., S. Reed Ave., N. Reed Ave., Hall St., W. Pruitt St., S. Baylor Ave., N. Baylor Ave., S. Congress St., N. Congress St., W. 22nd St., S. Randolph Ave., N. Randolph Ave., S. Logan Ave., N. Logan Ave., W. WJB PKWY., W. 24th St., W. 23rd. St., S. Sterling Ave., W. 29th St., W. 30th St., S. Sims Ave., W. 26th St., N. Parker Ave., S. Parker Ave., S. Bryan Ave., N. Main St., S. Main St., S. Tabor Ave., Regent Ave., E. 29th St,, E. 28th St., S. Houston Ave., E. 27th St., E. 30th St., Hudson St., Hammond, W. 17th St., W. 18th St., W. MLK St., W. 21st St., W. Pruitt St., N. Sims Ave., W. 16th St. , W. 15th St., W. 21st St. Residents are encouraged to contact Water Services at (979) 209-5900 if they have any questions.